The hard lures category is a vast offering of bait fish imitations and other prey-like objects. These lures, like soft plastics, come in a wide variety of actions, shapes, sizes, colors, and features. Hard lures such as the crankbait, jerk bait, spinner bait, and spy bait all mimic an injured or unwary bait fish that makes for an easy meal. Often included with rattles, lips, props, and more; these types of baits are excellent for what we call “searching”. 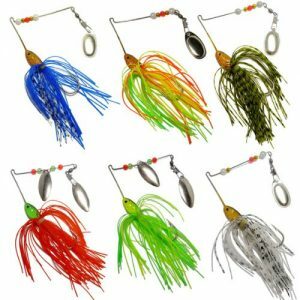 Because of their noise, color, and wild action (or subtle in the case of a spy bait), these lures create a lot of commotion in the water to attract fish from a much farther distance than a quiet, discreet soft plastic will. These lures are typically sold with treble hooks, so you must be mindful of the surrounding vegetation that you plan on fishing through. Meant to be fished at a faster pace than soft plastics, these lures allow you to cover a lot of water in a relatively short amount of time. In the next sections, we will discuss the most common types of hard baits available; the recommended equipment, and the theory behind the fishing technique. There is no other category of hard lures that is offered in as much variety as the classic crankbait. The success of this bait inundates the fishing media, and is termed by some to be a “dumb” lure because you can catch a fish with it by simply turning the reel. Because they have their own wobbling and rattling action, user input is typically not required, thus the term, “dumb” lure. Crankbaits feature a clear plastic lip of various sizes and shapes that determine the depth at which the lure dives, the amplitude of the side-to-side wobble, and the type of cover or structure you can fish it well in. These lures are typically floating, but some are able to suspend in the water at the right temperature. Round-lipped crankbaits are the standard diving crankbait. The longer the lip, the deeper the lure will dive. The wider the lip, the more side-to-side wobble the lure will have. Square-bill crankbaits have a square-ish shaped lip, that is great for fishing around rocks and tree branches. These are typically shallow water crank baits. The short and square-shaped lip allow the lure to deflect off of objects better than a standard round-lipped crankbait. This is a very easy lure to fish. Simply cast it out as far as you can, and begin reeling. You can change the speed at which you reel to suit the mood of the fish, and you can also throw in a couple jerks of the rod to mimic a dying bait fish’s last attempts at survival. The idea is to get the lure as far down as possible, even digging into the ground; to attract fish throughout all water columns that the lure is rated for. If you run into an obstacle with the lure and it becomes stuck, try to stop reeling and give the lure a few seconds to float up and out of the obstacle. As you are reeling, you will know you have a fish on when it suddenly becomes difficult to reel or you feel a heavy tug through the rod. Set the hook with a firm sweep of the rod in an upward-lateral direction. As the name indicates, this lure is a crankbait without a diving lip. They are typically slimmer in profile than a standard lipped crankbait, and will sink instead of float. Also referred to as a rattle trap (from the brand Rat-L-Trap), these lures rely heavily on its internal rattles to attract fish. The lipless crankbait is meant to be fished in light to moderate vegetation with a strong line to rip through the grass or weeds. These lures can represent a dying bait fish, or even a fleeing crawdad. Colors and rattles are its only form of attraction. The way you fish this bait is very important and will determine how successful you are on the water with it. By combining a standard retrieve with a couple rips and pauses, you can control the lure similar to a puppet on a stick. This bait makes an excellent search bait because of its slim profile and heavier weight. You can cast these lures a figurative mile, and cover a lot of water in a relatively short amount of time. Begin by casting parallel to the shore or a drop-off. Start your retrieve by pulling on the lure with your rod – do not rely on your reel to create the action for you. By ripping the lure through grass as you retrieve, you can create more commotion and action than the reel alone can. As a bonus, you will also be able to feel the terrain and vegetation around the area you are fishing much better than if you were retrieving with your reel only. Because of the lure’s ability to perform in vegetation, you might consider using thin braided line with a fluorocarbon leader to prevent breaking off. Jerk baits are more slender than the standard crank bait and also resemble an injured bait fish. Depending on the size of these hard baits, they can come with either two or three treble hooks, and some may even come jointed (2-parts). They have a small round lip to allow the lure to “vibrate” with each rip of the rod. Just like their crankbait counterparts, they contain rattles and may even suspend in the water for greater attraction and visibility. These baits are typically fished with a retrieve pattern, as opposed to a constant retrieve that you might fish with a standard lipped crankbait. Patterns of strategically timed twitches and pauses will allow your bait to look more natural to the bass, and will be more likely to incite a strike. As the name implies, this bait is meant to be fished with a series of “jerking” motions of the rod. While you may be able to land a fish with a simple constant retrieve, you would be missing out on all of the jerk bait’s features fishing it this way. Instead, you could use the properties of the jerk bait to better mimic a panicked baitfish, and increase your chances of catching a fish with it. By trying out different patterns and establishing a cadence the fish will bite to, you can almost scientifically hone in on what the best pattern is for your current conditions. Start with a simple twitch-twitch-pause (5 sec), and modify this rhythm and pause until you get a strike. With slight variations in the frequency of twitches or length of pauses, you can present more opportunities for the bass to bite. Spinner baits are an odd looking lure that combines the look and action of a swim jig with the added attraction of a reflective spoon. These baits are included with one or two (or more) rotating blades that reflect sunlight to attract fish from far distances. Spinner baits are excellent for stained or muddy waters where a fish wouldn’t be able to see a non-reflective bait. You will typically find spinnerbaits sold with two types of reflective blades included. Both blades serve the same purpose but do so in a different way. This highly reflective and attractive property make the spinnerbaits an excellent search bait to find where the bass might be schooling or hiding. To further enhance the attractiveness of a spinnerbait, you can add a streamlined trailer as long as it doesn’t negatively affect the action of the lure. If a trailer isn’t warranted, you can add a trailer hook in its place to catch fish on those short strikes. Colorado Blade: This blade type is very wide, and circular in shape. It creates a large vibration in the water when it rotates, and throws off an intense amount of reflection, especially on a clear sunny day. The Colorado blade is fished slightly slower than a willow-leaf bladed spinnerbait because of the increased water resistance the large blades are subject to. These are great for getting lethargic fish that aren’t up for a chase to bite the lure, and are capable of attracting fish from farther away. Willow Leaf Blade: These blades are slimmer in profile and are more hydrodynamic than the Colorado blade. As the name implies, it is shaped like a willow leaf and allows the spinnerbait to cut through the water quickly, while still maintaining its reflective and vibratory properties. Although these properties are less pronounced, the ability to fish this lure faster can entice bass who are currently chasing a school of bait fish around in the shallows. Simply cast the spinner bait parallel to the shore, a drop-off, or even in the middle of a school of baitfish that the bass are chasing. To get the most out of this bait, consider allowing it to sink to the bottom first, and slowly retrieving it. Continue to fish higher in the water column with each cast to ensure you are covering as much bass territory as possible. You can even throw in a couple fast twitches to further attract a fish or entice a bite. Because this lure stays relatively weedless, you may also throw this lure into or around cover, as the heavy metal wire will simply deflect off of the cover to prevent snags. With each cast, check your bait to ensure the skirt or other water-borne debris isn’t tangled up in the blade’s ball bearing swivel. You will need to clear any tangles to get the spinnerbait to work properly. Also known as prop baits, these lures are relatively new to the mainstream fishing market. Great for suspending fish or for use in clear water, this lure is a subtle and relatively quiet method of catching bass. Constructed with a forward and rear prop, as well as strategically placed weights, this lure puts out a slight vibration, but also wobbles as it falls. Because spy baiting is more of a finesse hard bait technique, you might consider using lighter line such as 6-8lb test, or at least a lighter line leader on a spool of thin braid. Spinning rods and reels may be recommended due to the light tackle. Spy baits are not meant to be used as power fishing lures. Instead, they are meant to subtly mimic the vibrations and shimmying actions of a bait fish in its last moments of life. The body of the spy bait shimmies in a fashion similar to that of a Senko, and this shimmy is what brings on most of the bites. Cast the lure out and allow the bait to fall on a semi-slack line. When the lure hits the bottom, you can fish it in several different ways. You can drag the lure along the bottom, you can pop the lure up over weeds and let it shimmy back down, or you can perform a standard retrieve with pauses to allow the lure to shimmy down. As with the spinnerbait, be sure to clear the props of any tangled debris, as this will greatly affect the rotation of the props and the fall of the lure. There are two ways you can tie on a hard lure. One method is to tie a duo lock snap to the end of your line and attach your lure to the snap. This allows you change out lures very easily and quickly if necessary. If your lure comes with a split ring attached to it, attach the line or snap to it – it’s there for a reason. The second method is to simply tie the lure directly onto the line without the use of any accessories. The advantages of this is a more natural look with less bulk, but the disadvantage is that you will need to retie a knot each time you want to switch lures out; this can be difficult and frustrating if you only have one or two rods at a time.